A pivotal year and we're just getting started! I hope this correspondence finds you well. Spring is fast approaching and I'm sure for many of us it can't come fast enough! For a season of rest, this winter wasn't very restful. Here at Lazarex we've been intently focused on preparing for 2018, which is turning out to be a pivotal year! 1. of crucial importance in relation to the development or success of something else. In late 2017 we received funding to launch IMPACT California this year. That's a very big deal, years in the making. In January we learned we've been successful in influencing the FDA to offer guidance allowing for industry (pharma) to reimburse patients' clinical trial travel expenses. It is a game changer on many levels. It is certainly a pivotal moment in finding a sustainable solution to address the financial burden patients bear in order to participate in FDA clinical trials. In April we are launching our inaugural Lazarex IMPACT 5.44K. This is an event that can be done anywhere around the country to rally support for Lazarex Cancer Foundation and the patients we serve. Please join us with your friends and family, where ever you are. This pivotal year is yours as well. When you support this foundation, you help to fulfill our mission to "Improve patient access to cancer clinical trials" as well as support the patients we serve. You have helped us build a movement that is changing cancer outcomes for mankind now and into the future. We can't thank you enough. 544 miles is the average distance our patients travel for cancer treatment in an FDA clinical trial. 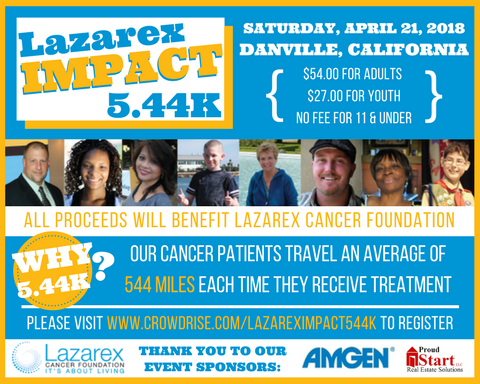 The Lazarex IMPACT 5.44K will be held locally in Danville, CA and remotely in Anytown, Anywhere on Saturday, April 21, 2018. Each participant's registration fee will help cover the cost of gas, airfare, ground transportation or lodging in the form of reimbursements to our patients for their travel expenses to and from their treatment locations, ensuring they can afford to continue getting treated. This is a family friendly event, dogs, kids and strollers are welcome. All you have to do is register for either the Danville, CA IMPACT 5.44K or to do a Satellite Lazarex IMPACT 5.44k in a location of your choice. There is no registration fee for kids under 12 or for Lazarex patients (present or former). Then invite your friends! Complete 5.44K (3.38 miles) wearing your t-shirt and bib, and share your day with us on social media. #Lazarex544K. A clinical trial saved Jessica's life and now that trial drug is helping others fight CML. It has been over seven years since Jessica was told she was cancer free as a result of her participation in a clinical trial! Additionally, the trial drug that she received was also approved by the FDA seven years ago. Jessica returned home and went back to work and her life in southern CA. 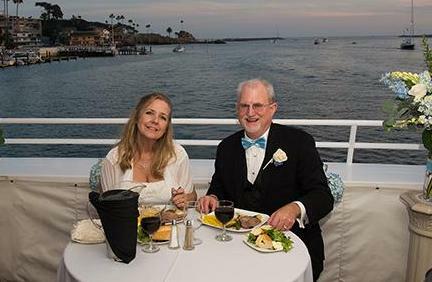 She recently married Jeff, her long time love in November 2017. Congratulations Jessica and Jeff! In 2009 Jessica was diagnosed with Chronic Myelogenous Leukemia (CML). Treatments available at the time failed to halt the progression of the cancer. Her oncologist suggested she consider a clinical trial at the University of California, San Francisco (UCSF). It would mean moving to San Francisco and putting her life on hold. The financial implications seemed insurmountable until she learned about Lazarex Cancer Foundation. Lazarex helped cover the costs for Jessica's stay in San Francisco and her subsequent trips from southern California. Within months on the trial Jessica got the news that the trial had been tremendously successful and there was no evidence of disease! Your dollars make hope real for cancer patients for whom a clinical trial is literally the only treatment option. When lack of financial resources prevent a patient from accessing potentially life extending or life saving treatments we all lose. Lives are cut short and we lose the potential of more effective cancer treatments or cures. Your support #GivesHope for the present and the future fights against cancer. 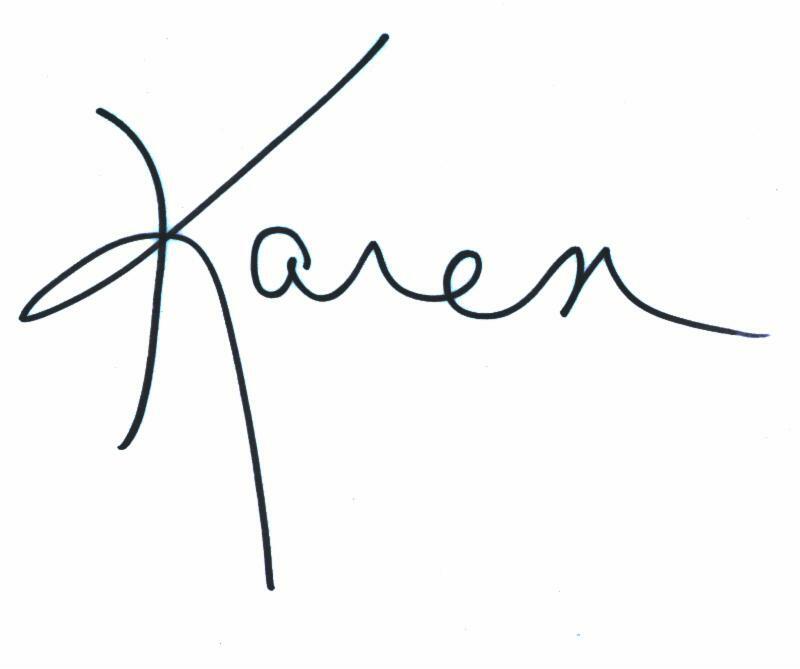 Set up a recurring gift to Lazarex Cancer Foundation. Persistence pays off! 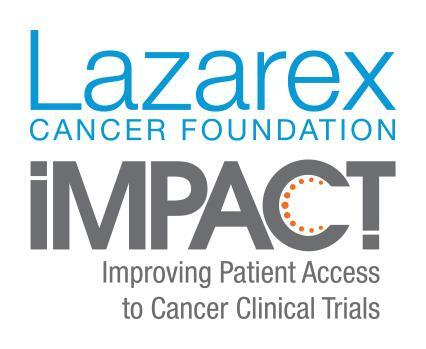 Lazarex is helping to solve the problem of the financial burden that cancer patients face for costs associated with clinical trial participation. Costs that prevent them from enrolling or remaining in FDA clinical trials. DANVILLE, Calif., Feb. 1, 2018 /PRNewswire-USNewswire/ -- The Food and Drug Administration has issued official guidance, giving the green light to reimburse patients for travel expenses to clinical trial sites. It allows all cancer patients access to potentially life-saving treatments. Lazarex Cancer Foundation brought this problem to the attention of the FDA. Lazarex is the only organization in the country helping patients find clinical trials and reimbursing them for travel expenses, and has been working to create an even playing field so ALL patients have access. "FDA does not consider reimbursement for travel expenses to and from the clinical trial site and associated costs such as airfare, parking, and lodging to raise issues regarding undue influence." Each year in October, Carondelet High School in Concord, CA hosts an activity to raise awareness and funds for breast cancer. 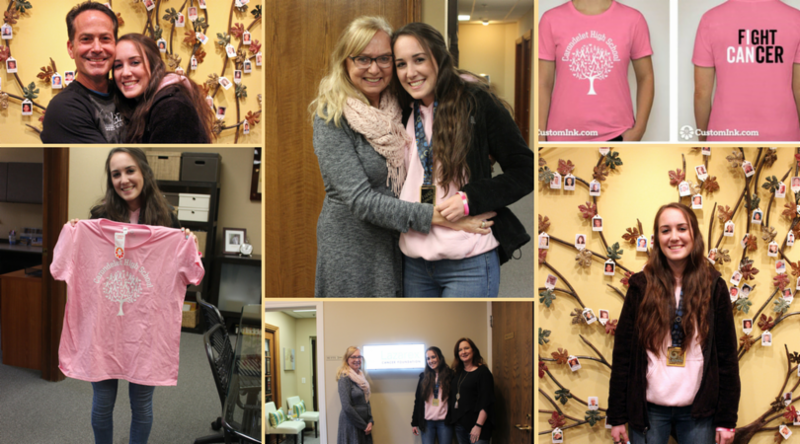 Last year, Angie Scoma, class of '19, organized the t-shirt sale in honor of her mom, Karen, who lost her life to breast cancer. She also gave out bracelets and information about early detection and prevention. Angie chose Lazarex Cancer Foundation as her benefiting charity. Angie and her dad, Chuck, stopped by the Lazarex office to deliver a check for over $2,300 from the fundraiser! It was a beautiful way to honor her Mom and we loved meeting them both. In true Cancer Buster spirit, Angie and her Dad are cooking up another fundraiser for this year so stay tuned! Why are clinical trials so important? They are the capstone of the drug development process and the vehicle our FDA uses to bring new drugs to market safely. Patient participation is critical to the successful completion of a trial. Clinical trials offer medical breakthrough opportunities available today to patients with advanced stage cancer who have no other treatment options. Most often, health insurance doesn’t cover the prohibitive ancillary costs. Lazarex is the only safety net for these patients until we find a cure. We improve the outcome of cancer care, giving hope, dignity and life to advanced stage cancer patients and the medically underserved by providing assistance with costs for FDA clinical trial participation, navigation through clinical trial options, community outreach and engagement. 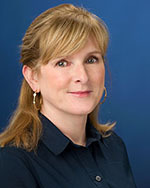 To learn more, please contact us at 925.820.4517, toll-free at 877.866.9523, or visit us at www.lazarex.org .